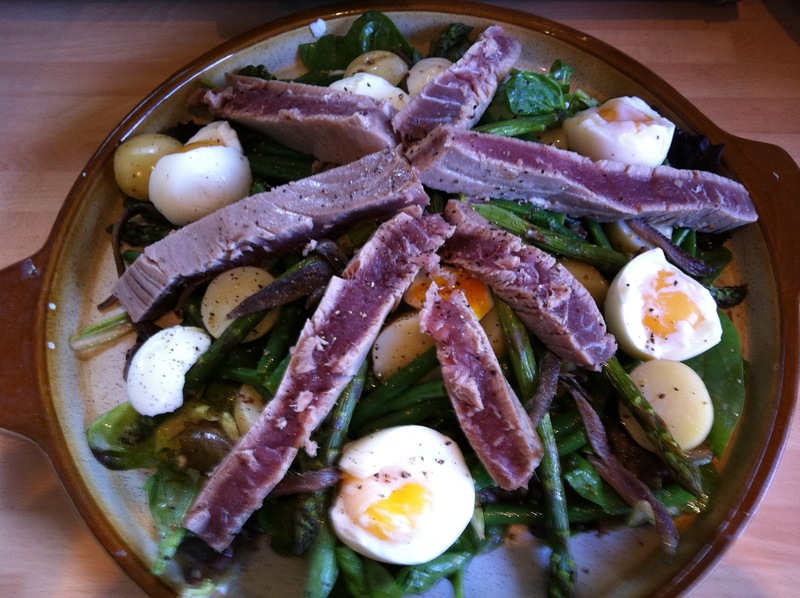 This is my version of a salad nicoise, without some of the traditional ingredients but with others added. You need to cook everything at the same time - the cooked parts of the salad should be served warm, so don't worry if certain elements are done before others. Start by boiling a handful of baby new potatoes. Whilst these are boiling, trim and grill some asparagus for 4 minutes or until they are just going soft. Get another pan of water on the boil and when boiling, put the eggs in for 5 minutes 30 seconds. Put a lightly oiled frying pan on a medium heat, and fry the tuna steaks for 1 minute on each side. Remove the steak from the heat and leave to rest for 3-4 minutes. When the potatoes are nearly cooked add the trimmed green beans to the water, boil for 2 mins and then drain. Mix salad leaves with the potatoes and green beans and cover with a dressing made from 2 parts olive oil, 1 part lemon, 1 crushed garlic clove, 1 teaspoon of grainy mustard and salt and pepper. Cover a large plate with this mixture. Lay your grilled asparagus on top of the salad mixture, and the anchovies on top of them. Peel the boiled eggs, cut in half and place on top of the salad. Then take your tuna steak and cut into slices and lay over the salad. Serve with crusty bread and a bottle of white wine, perfect for a sunny summer evening.